Sign Language Network of KY (SLNKY) was established in 2012 by Connie Meck. The agency was created as a way to help medical facilities in the greater Lexington Area streamline their sign language interpreter services. As a 24/7 full service agency we are able to meet the needs of the ever changing world of medical interpreting. The agency has expanded services greatly to include industry, performance, education, legal and social services. Our team of licensed interpreters consists of highly skilled, professional interpreters from diverse backgrounds with a dedication to serving the Deaf community. We are most proud of our outstanding customer service and our exceptional interpreting team. Connie resides in Lexington, KY. After graduating from college she had the good fortune to be offered a position at the South Carolina School for the Deaf and Blind in Spartanburg, SC. Those years were the most meaningful and life changing, forging a path of service and partnership with the Deaf Community. 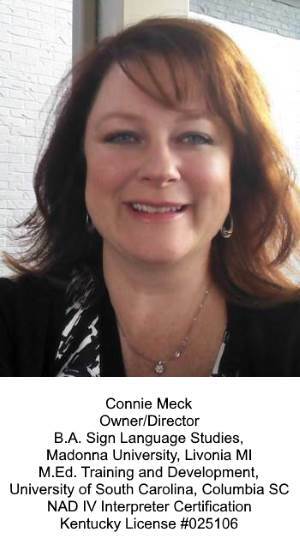 After marrying in South Carolina, Connie moved with her husband Bill to Virginia, where she utilized her degree in Training and Development to be a Program Director of Continuing Education at Virginia Tech. Next came Indianapolis where she had the opportunity to be one of the youngest Dean of Education ever hired at Indiana Business College. The last and permanent move was “home” to Lexington, KY. After teaching at Bluegrass Community and Technical College for several years, the tug to return to interpreting was strong. After freelancing again for a year, the the need for a consistent and strong professional interpreting network in Lexington became evident. 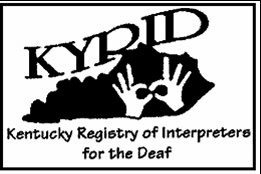 Sign Language Network of KY was born in 2012 and now includes several staff interpreters along with more than 25 contracted interpreters!